This dragon fruit martini is easy to make and beautiful to serve! 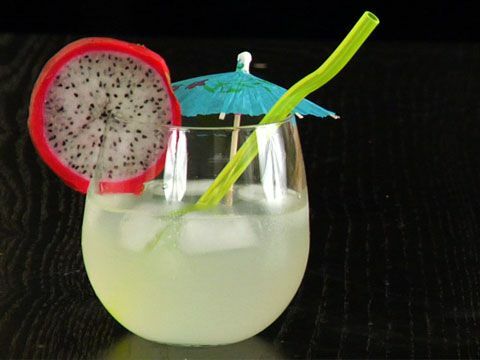 Your guests will be surprised and delighted by this refreshing cocktail, and the marvelous-looking dragon fruit also makes a great conversation starter! Dragon fruit is native to Thailand but is now readily available throughout North America (grown in Mexico and South America). Prepare your dragon fruit by scooping out all of the flesh. Place dragon fruit flesh in blender or food processor. Add all other ingredients and blitz 20 to 30 seconds on high speed. Taste-test for desired strength and sweetness, adding more vodka if not strong enough, or more sugar if you'd prefer it sweeter (note that the sweetness will also depend on the ripeness of your dragon fruit - the riper it is, the sweeter it will taste). If too sweet for your taste, add another squeeze of lime juice. If too strong for your liking, add more coconut milk. Pour out into martini glasses and garnish with your choice of garnishes. Enjoy! Dragon fruit is a beautiful fruit grown in Southeast Asia, Mexico, Central and South America, and Israel. The plant is actually a type of cactus, and the fruit comes in 3 colors: 2 have pink skin, but with different colored flesh (one white, the other red), while another type is yellow with white flesh. Dragon fruit is low in calories and offers numerous nutrients, including Vitamin C, phosphorus, calcium, plus fiber and antioxidants. Dragon fruit tastes wonderful! - sweet and crunchy, with a flavor that's like a cross between kiwi and pear. Dragon fruit is particularly suited to making drinks, since it is mostly composed of water, making it quick and easy to blend up. Note that we tested this recipe both with and without the coconut milk, and it was delicious both ways. If you like tropical cocktails, we recommend including it; if you're a classic martini drinker, you may prefer it without.